Ne’er-do-well “Captain” Jack Boyle, the Paycock, or peacock of the title (beautifully delineated by the Rep’s producing director Ciaran O’Reilly), mostly absents himself from supporting his family by claiming weak legs. They become even weaker when faced with the possibility of a job. Boyle spends most of his time prowling nearby pubs in the company of his buddy Joxer Daly (played to a T by wild-haired, intense John Keating). So it’s up to Jack’s long-suffering wife, Juno (Maryann Plunkett, in an immensely moving portrayal), to hold down the fort. 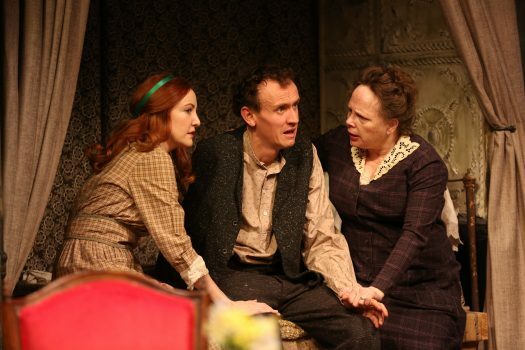 She is accompanied by their daughter Mary (a sensitive performance by Sarah Street) and damaged son Johnny (Ed Malone). Johnny had fought in the Civil War, which still rages around them in the streets of Dublin. Not only did he lose an arm in the conflict, but he also is always on edge, apparently for some real, or imagined, guilt. The ever-present war exerts tension in the household. Finances are worn thin. But a bright light suddenly appears: The family is to be left an inheritance through the death of a distant cousin of Boyle’s. Rejoicing is expressed by the sudden spending surge that results in some garish new furniture (appropriately tacky scenic design by Charlie Corcoran) and a cherished gramophone. However, bright lights do not flicker for long in the Boyle household. As the cousin’s will was not worded accurately, the longed-for financial gain abruptly fizzles, and the Boyles are now besieged with angry creditors claiming their cash back, or their goods. Literally taking the suit off Boyle’s back is the tailor Needle Nugent (Robert Langdon Lloyd). 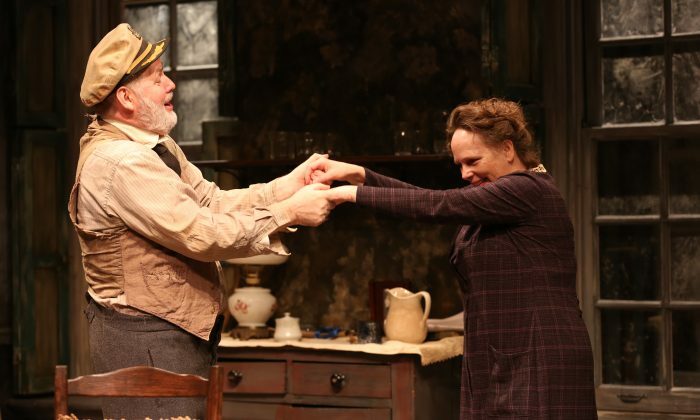 Then there is neighbor Masie Madigan (Terry Donnelly in an always dependable vim-and-vigor performance), who seizes the gramophone as payment for a long-established debt. As if things weren’t bad enough, Charles Bentham (James Russell), a high-toned suitor of Mary’s, takes off for London, leaving Mary to bear the unwanted fruits of their relationship. This sad fact discourages the attentions of Jerry Devine (Harry Smith), a down-to-earth neighbor who had truly loved Mary—until now. Tragedy and desolation ensue until the stage is virtually empty of everything, with no human life, no furnishings. When Boyle and Joxer stumble onstage, so numbed by alcohol are they that they cannot even grasp the supreme squalor and nothingness of their lives. 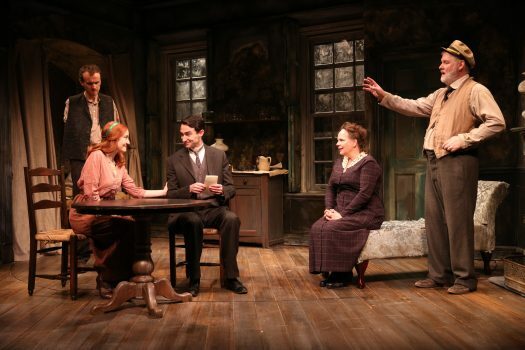 Director Neil Pepe, who has taken a brief leave from his position as artistic director of Off-Broadway’s Atlantic Theater Company to helm this production, has done an excellent piece of work, contributing neatly to the Rep’s long list of successful productions.